When a mole or freckle occurs in the white part of the eye, or sclera, it attracts more attention and may raise concerns about a health problem. These freckles are usually harmless. If the spot occurs suddenly, however, it may be a sign of a malignant cancer. Dark spots on the sclera are simply a pigmented lesion not unlike moles that appear on the skin, explains Minnesota Eye Consultants. The lesion, or nevus, may be flat or slightly raised and may range in color from black to brown to a pinkish color, writes David A. Lee and Eve J. Higginbotham in their book “Clinical Guide to Comprehensive Ophthalmology.” Occasionally the nevus contains no pigment. The nevus occurs on the sclera, the iris, which is the colored part of the eye, or the conjunctiva, which is the membrane that lines the insides of the eyelids and covers the visible surface of the sclera. A nevus may also occur on the choroid, or the tissue beneath the retina on the back of the eye, notes Minnesota Eye Consultants. Choroidal nevi can only be seen with a specialized lamp. Freckles on the eye are collectively called pigmented tumors, although most are harmless. Congenital nevi are the most common type of pigmented tumor, notes the website Eye Cancer Network. Other types include primary acquired melanosis and conjunctival melanoma. A biopsy determines the type of lesion. The specialist may decide to watch the lesion without taking a biopsy, choosing to test the lesion only if it shows signs of growth. Nevi are caused by an overgrowth of melanocytes, or cells that produce pigment, says Minnesota Eye Consultants. Melanocytes are found in the eyes, skin and other tissues. Most people with nevi are born with them, or the spot forms early in childhood. People with darkly pigmented skin often have congenital nevi. Congenital nevi may go unnoticed until puberty, when the spot becomes darker or larger, say Lee and Higginbotham. Primary acquired melanosis typically appears suddenly, notes the Eye Cancer Network. It usually occurs in middle-age people with fair skin. 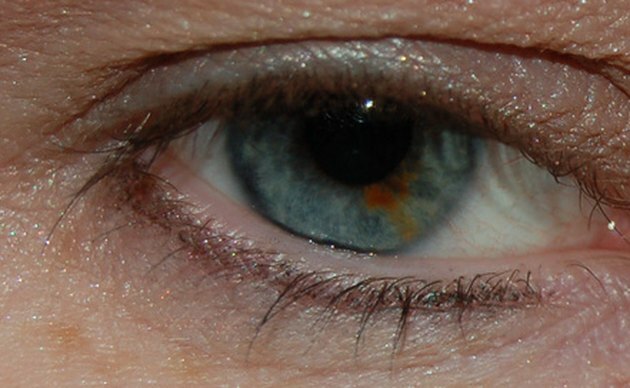 Conjunctival melanosis is rare, says the website Surgical Pathology, and begins as primary acquired melanosis, congenital nevi, or occurs spontaneously. Congenital nevi have no symptoms and require no treatment. Most pigmented lesions are benign, says the Eye Cancer Network. Cancerous lesions are surgically removed. Eye care professionals should carefully watch all pigmented lesions for any signs of growth or change in shape, paying particular attention of the lesion develops an extensive blood supply or extends to the cornea. Benign nevi may grow, but their growth is slower than that of malignant lesions. Nevi that show changes in size or shape should be biopsied, advises Minnesota Eye Consultants. Congenital nevi rarely become cancerous. A change in color without changes in size or shape does not signal malignancy, Lee and Higginbotham say. “Clinical Guide to Comprehensive Ophthalmology”; D.A. Lee &amp; E.J. Higginbotham; 1999.